On social media, hashtags have long been used as a shorthand way of organizing a conversation around an event or topic. One widely used hashtag over the past year is #Ferguson, which started after the police shooting of an unarmed black man in Ferguson, Mo., and has since become a kind of connective tissue for the massive number of social media posts about the event and what it has come to represent. In a new analysis of the #Ferguson hashtag on Twitter and Instagram, Pew Research Center has found some striking differences between the two social media platforms in how people use the hashtag and direct the conversation. On Twitter, which quickly became a source of information about the Michael Brown shooting last August, usage of the hashtag #Ferguson has primarily focused on the discussion about Brown, the ensuing protests and the authorities’ response. But on Instagram – a growing photo-sharing site with roughly the same number of users as Twitter – the usage is much broader. There, the hashtag has been employed less as a reference to the events in Missouri, and more often as a way for people to discuss or reference issues such as race, police brutality and politics. In other words, the content and context a user gets from tracking the #Ferguson hashtag on Instagram is quite different from on Twitter. For example, 86% of the Twitter conversation with that hashtag was directly related to the news in Ferguson, such as the community protests, the U.S. Department of Justice report or the city’s police department. 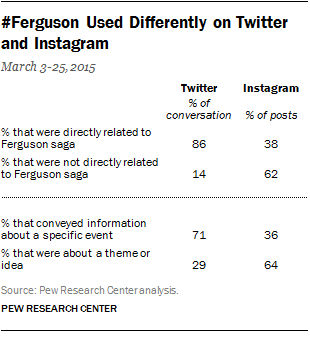 And unlike on Twitter, a majority (62%) of the Instagram posts studied were not directly about the events of Ferguson and their aftermath, but instead used the hashtag to make a connection between the subject of the post and the Ferguson saga. 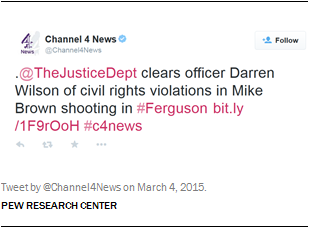 By contrast, 38% were posts where Ferguson was the subject. 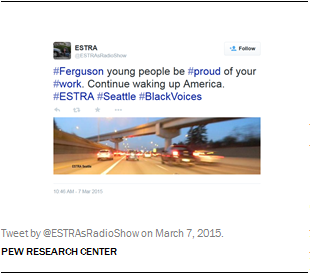 To analyze #Ferguson on Twitter and Instagram, we utilized two different methods. For Twitter, researchers used the social media analytics tool from Crimson Hexagon to conduct computer coding of all public tweets starting on March 3, 2015, when new developments brought Ferguson back into the headlines, and ending on March 25. Instagram is a less mature and less studied platform than Twitter, and there are fewer tools for analyzing its content. To study Instagram, researchers pulled publicly available posts directly from the site’s API (application program interface) and performed human coding of a random sample of posts appearing during the same period. From March 3, the day before the Justice Department released its report on the Ferguson Police Department and the events surrounding the shooting, to March 25, about 650,000 tweets included the hashtag #Ferguson. The majority of those were focused on happenings either in Ferguson or directly related to Ferguson. James Cooper, aka @CoopFogg, shared information about ongoing meetings. 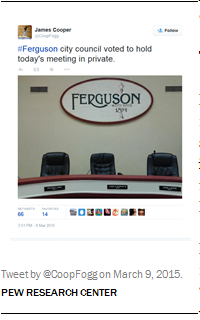 “#Ferguson city council voted to hold today’s meeting in private,” he wrote to his followers on March 9. Just 14% of the conversation with the hashtag was focused on events located elsewhere. There, Twitter users included the hashtag when commenting on other incidents that involved alleged police brutality – such as the shooting death of 19-year-old Tony Robinson by a police officer in Madison, Wis. Researchers also looked at the Twitter data another way, classifying tweets tagged with #Ferguson as either focused on a specific event (in Ferguson or beyond), or else focused on a broader theme or issue. During the period studied, 71% of the Twitter conversation was focused on a specific current event, while 29% focused on themes. The portion that was more thematic in nature included references to the protests in general, or issues that have been brought to the forefront because of the situation. If someone followed the #Ferguson discussion on Instagram, however, they would have discovered a far different conversation. 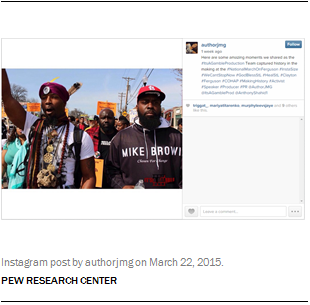 First, there were far fewer public posts over the same time period (March 3-25), about 8,400, and the hashtagged conversation was more thematic in nature and less focused on events occurring on the ground in Ferguson. The architect of the U.N. slavery memorial, Rodney Leon, posted a close-up picture of the structure, which was to be unveiled in New York on March 25, and included #Ferguson to connect the different happenings. 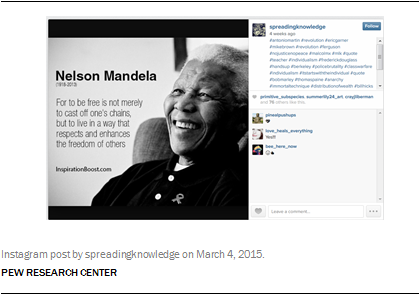 Nearly two-thirds (64%) of all the Instagram posts studied were not about specific events, but were focused on themes and ideas around race and the history of civil rights. The other 36% were about specific events, whether tied to Ferguson or elsewhere. 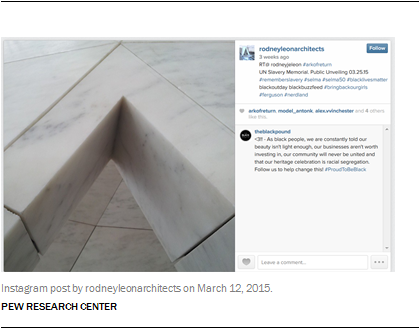 Since Instagram gives users more space for text than Twitter, many Instagram posts included a long list of hashtags. Meaning for the author was often conveyed by the connection of those hashtags, rather than an explicit reference to the picture. 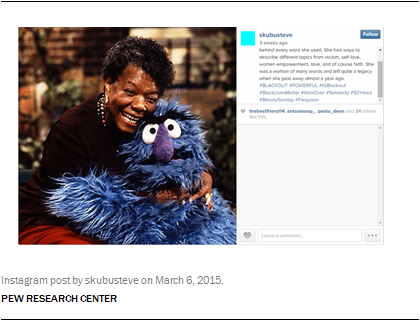 For instance, skubusteve posted a remembrance of the poet Maya Angelou that included a number of different hashtags such as #BlackLivesMatter, #50Years and #BloodySunday along with #Ferguson. A number of other theme-oriented posts involved religious images. 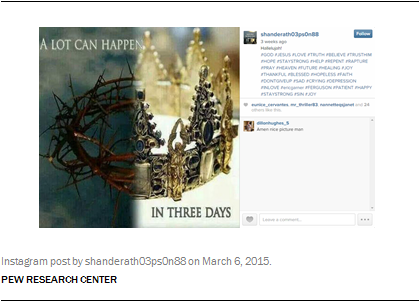 One Instagram user, shanderath03ps0n88, posted an image with many religious hashtags such as #GOD. #PRAY and #JESUS, but also included references to current events such as #FERGUSON and #ericgarner. While they were less common on Instagram than Twitter, there were still some posts focused on specific events, many of which were tied to the news out of Ferguson. 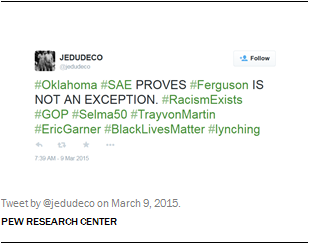 For example, Instagram user authorjmg posted an image of a protest march in Ferguson. “Here are some amazing moments we shared as the #ItsAGambleProduction Team captured history in the making at the #NationalMarchOnFerguson,” she wrote. Conversations on social media, of course, extend further than just the posts containing a hashtag. But hashtags remain a key tool for organizing a flood of information in a complex set of networks such as those on Twitter, Instagram and other sites. Hashtags can also provide an entry point into a topic or news item for a social media user. The data shown here, while covering a brief window of time, provide a sense of just how different the tagging norms can be on one platform versus another. The data also suggest that a conversation referencing a major news event such as #Ferguson can take on a life of its own, and show up in places far from where it started.